It might seem surprising that a colony of ants would tolerate the type of guests that gobble both their grub and their babies. Rachelle Adams, an ant expert at The Ohio State University, wanted to better understand the dynamics of the symbiotic relationship between parasitic Megalomyrmex symmetochus ants and Sericomyrmex amabilis hosts. 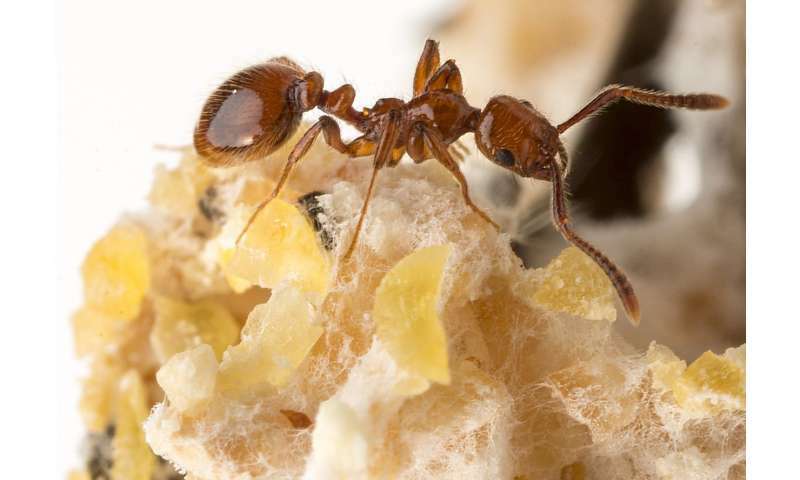 The host ants spend their lives farming fungus. The party crashers come in, don't contribute to the work and eat both fungus and ant larvae. This lopsided arrangement goes on for years. When they began the study, Adams and her collaborators knew that there were some obvious explanations for such behavior in nature. It could be that the parasites smell like the hosts and therefore go unnoticed, a situation called "mimicry." It could be that they smell like nothing and are essentially invisible intruders, a strategy called "insignificance." But when the researchers analyzed the odiferous hydrocarbons on the ants' bodies – the ant world's way of cueing the insects into whether they're encountering a nest mate or an outsider – they found that neither of these explanations told the entire story. The compounds on the intruders' backs were subdued, but that didn't seem to account for the accepting behavior of the host ants. Instead, the host/parasite relationship appears to be built on mutual protection from a more fearsome foe, said Adams, an assistant professor of evolution, ecology and organismal biology. The parasitic ants possess a volatile alkaloid-based venom that the host ants detect from a distance. The parasite ants' potent chemical weaponry is known to work against a more-lethal invader ant. "It's likely a scenario where the enemy of your enemy is your friend," she said. To better understand the interplay between the ants, the researchers introduced the parasitic Megalomyrmex ant to Sericomyrmex host ants in a laboratory-controlled face-off. "When confronted with a parasitic ant, the farmer ant will at first lunge at the intruder, but then instead of biting, she'll pull away and bow her head down, in a submissive response." There are more than 250 species of these fungus-farming ants in the United States and in Central and South America, she said. The ants studied in this research live in Panama. "These fungus farmers start little farms and care for the fungus garden by feeding it and protecting it from pathogens," Adams said. The crops are bountiful – more than what the host colony needs – so when the parasites invade it doesn't cause a tremendous amount of stress to either the fungus or ants, she said. And while they do eat some of the ants' protein-rich brood, they don't kill the queen and the host colony remains healthy. Going forward, Adams hopes to discover whether or not this parasite-tolerance behavior is transmitted from parent to offspring colonies. Not all Sericomyrmex amabilis colonies live with parasites in their midst. Scientists estimate that about three-quarters of colonies host parasites. "From an evolutionary standpoint, we're interested in the ongoing relationships between hosts and parasites and what drives these seemingly unfair cohabitations," Adams said. "We now know that we need to not just consider hydrocarbons but consider other ant-derived chemicals that influence their behavior."